When the garage door refuses to budge after coming home from a long day or running late to get the started day, anyone might have a mild temper tantrum. As the garage door is often the primary entrance and exit for most families, the good news is that there are alternatives to get the garage door unstuck to get your vehicle in or out. 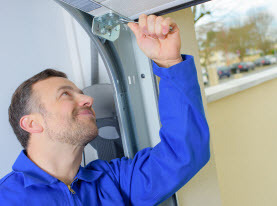 Identifying the problem, however, is the first step to resolving the manner, so after you have had a moment to relax, we at Vegas Valley Garage Door Repair would like to elaborate on the most common reasons as to why the garage got stuck and a few solutions. Not exactly a problem for folks living in the desert of Las Vegas, NV, but in other parts of the world, a common reason for the garage door getting stuck in the colder climates is ice have frozen the over garage door components. To free the garage door, simply pour hot water over the ice buildup. Now, Vegas Valley Garage Door Repair will elaborate on the most likely reasons a garage door gets stuck in Greater Las Vegas. 1) Garage door tracks should be inspected. The tracks can easily be the culprit and are often the reason why your garage door seems stuck. If the tracks were bumped, jostled, or simply managed to become misaligned, the garage door won’t open. You can realign the tracks yourself in most cases. Be sure to use a safe and sturdy ladder and use your hands to feel the tracks’ length for signs of misalignment, or to even see if they are bent, damaged or obstructed with debris. Squirt some WD-40 to free the track from any rust or to loosen it up and use a wooden block and a hammer to carefully knock it in place. If you are unsure about the process, contact professional garage door repair for assistance. 2) Ensure garage door opener remote batteries are not dead. Too many homeowners presume the garage door not opening is due to mechanical failure. However, the most common cause is rather simple; the battery from your remote-control garage door opener has depleted. Garage door opener remotes require a variety of batteries, but most can be found at your home improvement department store. 3) Try to manually open the garage door. If the problem is still manifesting itself, try opening the garage door manually. If you are able to open the garage door by hand, the issue may be an electrical problem. 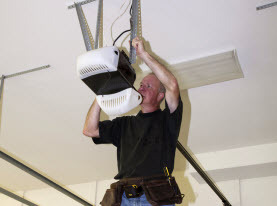 Unplug and re-plug the automatic garage door opener from the ceiling outlet. If that is not remedying the issue, check the circuit breaker to make sure that it has not tripped. If the problem still persists, contact a professional for further assistance. 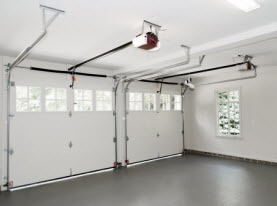 More often than not, the above mentioned solutions can get your garage door unstuck. In rare instances, the problem can be electrical or mechanical in nature. If this is the case, you need a skilled professional to assess the garage door to find the underlying problem. 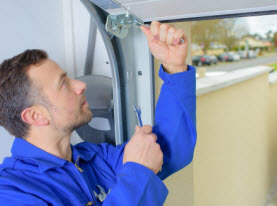 If you are experiencing problems with your garage door in the Las Vegas, NV Valley, call Vegas Valley Garage Door Repair today and let our trained technicians get your garage door running efficiently as quickly possible. © 2018 Vegas Valley Garage Door Repair. All rights reserved.